It might come as a surprise, but Napa is not the only area in California that is known for their wines. In fact, much of the Northern and Central areas of California offer fantastic wines as the area and mild climate is perfect for vineyards. If love sipping on Sirahs and you’ll be in the Monterey area, be sure to check out the local wines. Read on to find out how you can enjoy some of the local wines. One way to experience the impressive South Monterey County wineries is by signing up for a tour through Experience SoMoCo. This tour company is the premier Salinas Valley tour company that is based out of South County. Serving the heart of the Steinbeck Country, the tour guide will take you on a journey through various local wineries while providing you with interesting information about the area and its history. Visit the website today and see what you can discover on an Experience SoMoCo tour today. Wrath is a local winery that manages to bottle the passion of wine making and the power of nature into luxurious wines. Grown from vineyards on site, these grapes go on to become unforgettable pinot noirs, chardonnays, sauvignon blancs, and syrahs. The estate vineyard is located in the Santa Lucia Highlands and guests are encouraged to stop by these hills and sip on wines at the Wrath tasting rooms. The Winery Tasting Room is open Friday through Monday, 11am - 5pm. Stop by today! For a laid back time with friends, you’ll want to visit, Taste of the Pinnacles, a wine bar and lounge. This lounge offers up exclusively, California’s finest wines in a fun and friendly atmosphere. 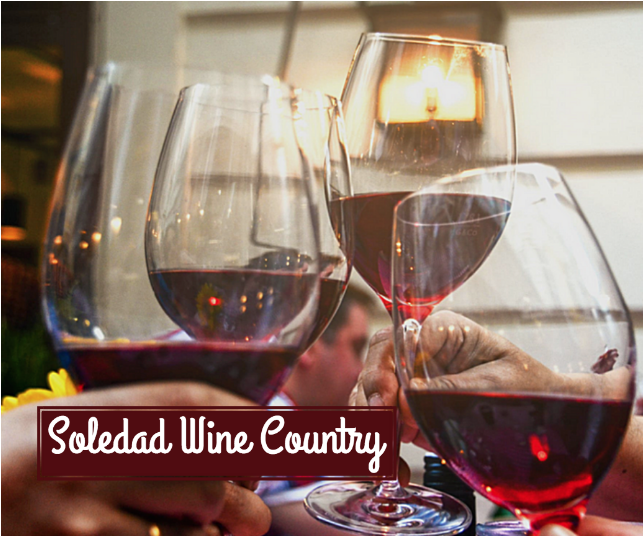 In fact, many of these wines come from local Soledad wineries so a stop here is a great way to discover more about the wines of the area. Have a friend who enjoys beer more? No worries, there’s California brewed beers on tap as well.